Our appearance tends to capture the immediate attention of others quickly. Research has proven that a slimmer and prettier face significantly improves our chances of befriending at school, bonding with other people, getting a job, and getting a professional career advancement. It is a well-known fact that the better your face looks, the better chances that you are perceived as kind, intelligent and charming. Unfortunately, not all people are born with an anatomically pleasing facial shape. And many are born with the excess weight in the face that causes the double chin, the big cheeks, and the less-than-ideal cheekbones. Although studies have shown that more fat in the face would help you age more gracefully than those with a slimmer and sculpted face, a big face lowers your confidence in front of the camera. And sometimes, it makes you look fatter than you are. Facial weight, whose manifestation is in the big cheeks, the double chin, and the overly round face, has always been a dread for ladies who adore the oval face. Excessive facial weight could be blamed on the way fat is stored in your body, and most of the times our genetics determine how much fat goes to your face. However, it could be caused by alcohol consumption – many people wake up with a puffy face after a night of drinking. Dehydration could also be a factor; when your body is experiencing thirst, it instinctively stores more water in anticipation of a long period without water, causing more liquid to go to parts of your face. Sometimes, it could be the symptom of an underlying and serious medical condition such as Hypothyroidism. This is when the thyroid gland located in your neck is releasing too little of the thyroid hormone and making a face look puffed up. Here are the eight proven facial exercises that work to shave the excess weight off your face without having to pay a fortune for plastic surgery. Note that these facial exercises cannot act as a form of treatment if the underlying cause of the facial weight gain is a medical condition such as Hypothyroidism. 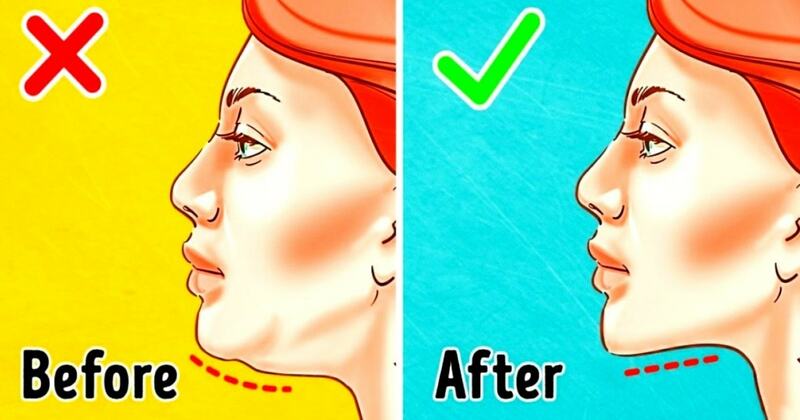 A double chin cannot go away overnight, but it could be banished gradually with very simple facial exercises. For ages, people have used the chin lift regime to achieve a slimmer-looking face. The chin lifting exercise has been used because of its superior effectiveness in working and stretching your facial muscles to get rid of that fat reserve. This is one of the facial exercises that can be done regardless of whether you are standing or sitting, and it can be done anywhere, anytime you like. To work out your face, the first step is to tilt your head towards the ceiling while your eyes look straight upward. Try to mimic the “kissing motion” with your lips, count in your head for 10 seconds then relax your facial muscles. It is advised to repeat the exercise 10 times, each turn taking 10 seconds. After the chin lift, you can follow up with the lips pull exercise where you lift your lower lip up and push the lower jaw out at the same time. Begin by lifting your lower lip up as much as possible while you push the lower jaw out. Repeat the exercise ten times, each turn taking 10 seconds. It is very straining on your facial muscles, but the strain would go away after some time of practice. The lips pull along with the chin lift are the most effective facial exercises. But as every guru says, if you do not follow a strict diet, no exercise can be effective enough to banish the fat from your face! 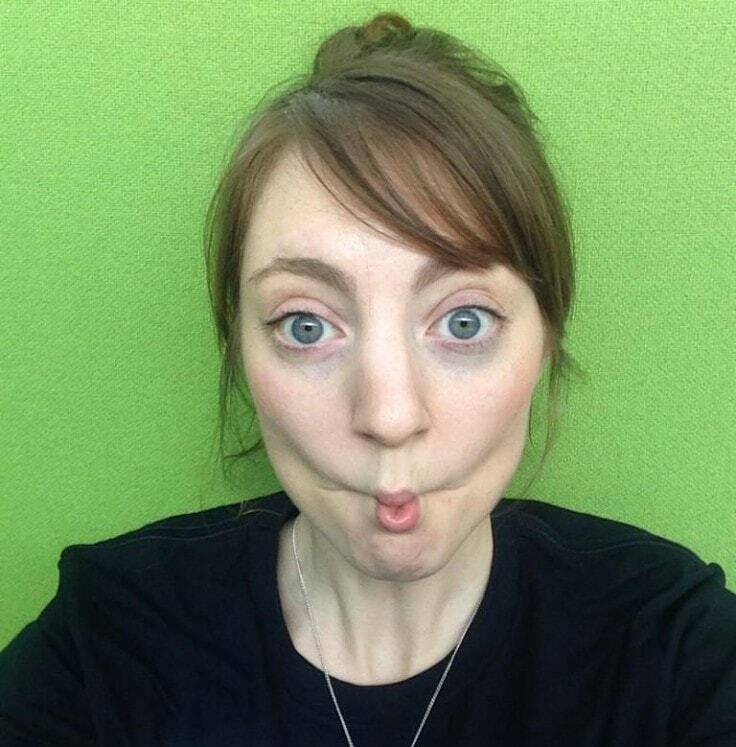 Being a trendy selfie pose, “the fish face” has quickly gained huge popularity not only in the Instagram circle but also within the yoga community for losing facial weight. It is simple, easy, and convenient as you can lose the facial weight and take a hilarious selfie at the same time! 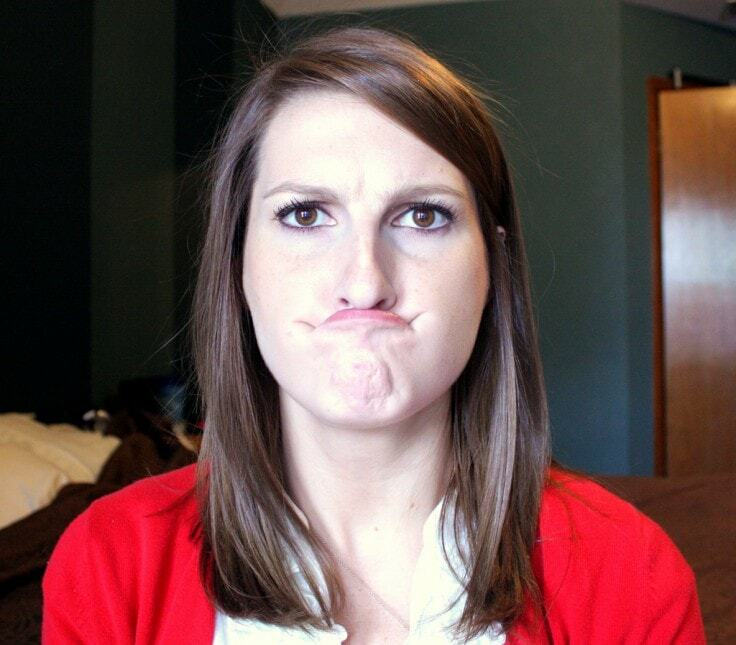 This exercise helps with “toning up” your cheek muscles, by sucking in your cheeks and lips but trying to smile at the same time. Repeat the “smiling fish face” for ten times, each time for 5 seconds, and you will feel that your jaw muscle strains pretty quickly. The pros of the smiling fish face are the convenience of working out your facial muscles and doing what you love at the same time, such as listening to your favorite playlist or binge-watching that long-awaited TV show. The only “drawback” is that you and your friends might laugh at how silly you look in the “fish face” selfie that just went on your Instagram! Remember how you used to blow out your birthday cake candles when you were a kid? Now, you do the blowing when you sit back on a chair, tilt your head back until you look at the ceiling, then pull your lips and blow out air from your mouth as if you’re trying to blow out your birthday candles and making your wish. This seemingly childish exercise is superior in working almost all the facial and neck muscles to help reduce the fat and water stored in your face and make it look leaner and sharp than it is. To add the exercise to your regime, repeat it ten times at once, try holding 10 seconds per turn. This exercise is basically “chewing on air”. It involves moving the muscles of the jaw to get rid of the excess fat in your jaw and chin. For each turn, firstly, you move your jaw in a chewing motion with your lips closed. Then, you breathe in deeply and breathe out and humming at the same time. After that, try to open the mouth as wide as possible while you press the tip of your tongue on the bottom of your teeth, and keep the posture for 5 seconds, after which you breathe in and out normally again. Try to repeat the whole exercise 10 times and try to hold out for 5 seconds in the third step. This exercise helps you achieve higher cheekbones, and a more defined and sexier jawline, as it stretches all the muscles around your lips, jaws, and cheeks. It is a game of X’s and O’s, but it is done with your mouth! Who doesn’t want to have some fun while exercising? While it is commonly perceived as a child’s game, this facial exercise is very effective in working all your facial muscles and burn off the excess fat from your chin and cheeks. So, practice with a friend, use your mouth to form the X’s and O’s alternatively in the weirdest and exaggerated way you can think of for at least ten times. 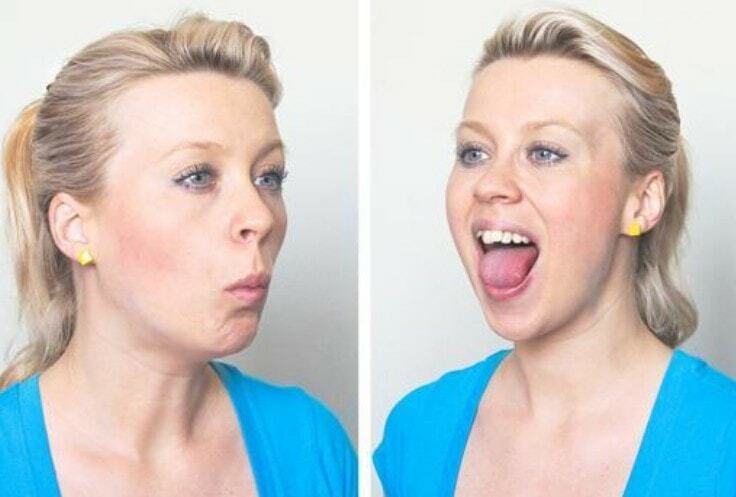 Don’t forget to have fun while doing these facial exercises! This habit not only helps keep your gums healthy and your teeth clean but also shaves the fat off your face. This technique tones up the cheeks and gets rid of your double chin fast. If you use mouthwash regularly, you already know how this exercise works. Simply puff up your cheeks with air (or mouthwash), transfer the air or the liquid from one corner to the other corner of your mouth repeatedly for a couple of minutes, then relax and repeat the motion for several times. Did you know that smile is one of the most effective facial exercises to slim down your face? While smiling seems ubiquitous and taken for granted for most of the people, have you noticed that it helps with longevity, mental health, and even slimming down your face? People often say that a smile is better physically than a frown because smiling involves more muscles and tendons of the face than the frown does. A wide smile stretches the muscles of your cheeks and smiling would help you achieve that leaner face and get rid of bubbly cheeks. Now you have one more reason to smile more than ever before!